PEARL, MS -- In the regular-season finale at Trustmark Park Tuesday evening, the Mississippi Braves completed the series sweep by defeating the Birmingham Barons 6-1. With the win and another win by the Jacksonville Suns, the M-Braves maintained a one-game lead in the Southern League South Division race with five games to play. 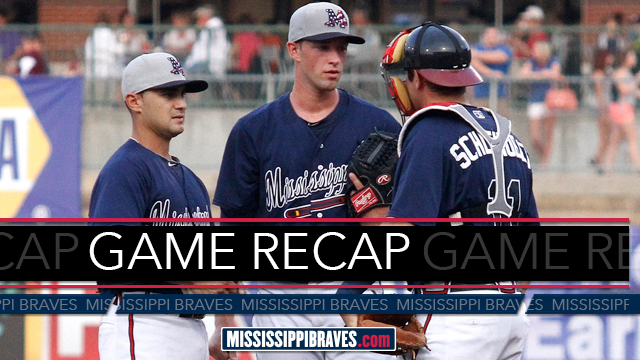 Tonight's victory was the M-Braves eighth consecutive victory, tying a Mississippi team record. Mississippi (41-24, 80-54) scored six runs on nine hits while Birmingham (29-36, 58-77) plated one run on eight hits. Daniel Castro led the Braves at the plate with a three-hit night. Erik Castro added a two-hit night. The M-Braves jumped out to a quick lead in the first. Gustavo Nunez singled and Kyle Kubitza walked to start the inning. Cedric Hunter followed with a triple to center, plating both runs. Seth Loman's base hit made it 3-0. David Rohm then doubled down the right field line before Castro delivered a two-run single, making it a 5-0 game. Tim Anderson blasted his first Double-A home run with a solo shot to the Braves bullpen in the third, cutting the M-Braves lead to 5-1. In the bottom of the eighth, E. Castro reached on an error by the first baseman. D. Castro then delivered a double to left field, driving home the pinch-runner Barrett Kleinknecht and extending the M-Braves lead to 6-1. Mitch Atkins (6-1) held the Barons to just one earned run on five hits and a home run. He walked one and struck out four in seven innings pitched. Myles Jaye (4-12) gave up five earned runs on eight hits and give walks. He struck out one in six innings of work and took the loss. Ryan Kelly and John Cornely worked the final two frames to close out the game. The M-Braves take a day off before traveling to Huntsville for the final five-games of the 2014 regular season. In game one of the series Thursday, the Braves send right-hander Jason Hursh (11-6, 3.23) to the hill. First pitch is slated for 6:30 PM.